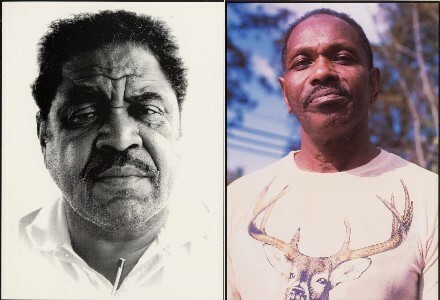 Both Elmo Williams and Hezekiah Early are from Natchez, Mississippi. Hezekiah, formerly of Hezekiah and the House Rockers, is still the only man going who can simultaneously beat drums and blow through harmonica with the aid of electrician’s tape and a mike stand. Hezekiah has no competition – that must be nice. Elmo, armed with a Yamaha guitar and a full Fender Band Master stack, does everything else. For Elmo, learning riffs has always come easy, as having respect for others, their beliefs, values, and personal property has always been difficult. The harder he tries to respect others, the harder it gets. Things would be a lot easier if he’s just give up. When not in church praying or playing guitar, Elmo mostly enjoys staying out of trouble. Hezekiah loves busting big ol’ deer damn straight dead with his rifle both in, and out, of season. If he’s really bored he might eat some of it. He also enjoys driving his Thunderbird with the accelerator stomped all the way down. It makes him feel good about himself, grinding that floppy accelerator past where it should stop and into the carpet. This style of driving is Hezekiah’s way of giving something back to America, his own personal way of standing up for the rights of All-American men. Don’t think for a second that these acts don’t go unnoticed. Ask anyone in Natchez – Hezekiah Early has a humdinger of a reputation.